One shot with an iron-sighted Marlin in .32 Special (Hornady ammo) killed this elk at 130 yards. From the .30-30 to the .375, myths abound. Herewith some observations about what kills elk best. The century-old .30-06 still ranks as a favorite among elk hunters. Modern loads make it deadlier. When our eyes met, mine got wide. The bull, seemingly close enough to touch, stared back, antler tips ivory arcs against the inky forest. Slowly, rifle bobbing to my pulse, I cheeked the stock and peered through the scope. Dusk had stolen the dot. After a frantic search for the dot against the elk’s dark shoulder, I dropped the scope field to the grass. The dot appeared faintly in my peripheral vision. It vanished as I jerked the re-barreled Mauser up onto the elk and pressed the trigger. A 180-grain Speer handload dropped the bull. Forty-two years later, the .300 Holland & Holland still ranks among my favorite elk rounds. But I’ve used 36, if memory serves, and carried on elkless hunts rifles chambered to other cartridges. They’ve all helped shape my views on elk loads. Constrained by the one-bull-per-year-per-state limit imposed on elk hunters everywhere, I’ve used no cartridge exhaustively. So these notes are hardly authoritative. Even if by sunny good fortune you were directed to test one cartridge on elk and permitted to take several bulls in a season, you’d have a hard time drawing unassailable conclusions. Each shot is unique. A bullet’s effect has less to do with cartridge design, or even the bullet itself, than with range and shot angle, animal size and the missile’s track inside. Besides, myriad loads are possible for any one cartridge. The .30-06 appears in about 80 types of factory ammo. Many times that number of handloads can be fashioned, with bullets and powders that continue to proliferate. Is the .30-06 a good elk cartridge? Land sakes, yes! It’s been felling elk for more than a century under a wide range of conditions. Surveys I’ve taken of thousands of elk hunters put it neck-and-neck with the 7mm Remington Magnum in popularity. A huge success since its 1962 debut, the 7mm Rem. Mag. turns up in elk camps as often as the .30-06. A better choice for elk hunting than Remington’s big 7mm is tough to find. Introduced in 1962 with the Model 700 rifle, it featured 150- and 175-grain factory loads. Neither seemed to me ideal for elk, though Wyoming outfitter Les Bowman and the Remington company promoted the round masterfully. Its flat arc and relatively light recoil appealed to hunters. Still, many considered 150 grains on the light side for elk. The 175’s weight throttled its muzzle velocity; a nose profile better suited to alder thickets sapped speed and energy downrange. Ballistically, the heavy 7mm load delivered no more reach or punch than a 180-grain spitzer stoked to redline in a .30-06. I asked a Remington troll why Big Green had chosen the 175 over a sleek 160-grain bullet that could be driven much faster but held significant in-flight advantage over a 150 Core-Lokt. “We had a lot of 175s available,” was the reply. Since then, a raft of racy, controlled-expansion 160-grain 7mm bullets have appeared in factory loads and as components. They (and a broader selection of 140s and 150s) have given Remington’s iconic magnum more reach, ferocity and versatility. Some years ago, I followed the echoes of a bull elk into an Oregon canyon. He climbed out ahead but paused on a rim trail. I flopped prone and fired my Model 70. At the crack of that 7mm Magnum he collapsed, spine severed between the shoulders. I’d held a tad high, thinking 300 yards of gravity would tug my bullet into the lungs. Not so. That slippery 160-grain Swift Scirocco lost only a hand’s width. The author killed this last-day Colorado elk at 250 yards with a Ruger rifle in .300 Win. Mag. The .300 Winchester appeared a year after Remington’s 7mm. Oddly enough, given expectations of the rabble, it was not the .338 Winchester necked down. Its 2.62-inch case and short neck gave it more capacity than other (2.50-inch) short belted magnums of the day. It hurled a 180-grain bullet as fast as the 7mm Remington could a 160. Arcs are nearly identical for the same bullet style, but of course the heavier .30 hits harder. A 160-grain 7mm Core-Lokt Ultra in a current load brings 1,580 foot-pounds to 400 yards – plenty to kill elk, but well shy of the 1,750 delivered by the .300’s 180. One of several .300 Winchester Magnum rifles I’ve owned was a 1963 Model 70 with tiger-tail walnut – a rare find in those days of fence-post wood before the 70’s 1964 overhaul. Accurate and slick-cycling, that Winchester was my go-to elk rifle before I sold it in a fit of insanity. Another pre-’64 .300 went the same way. I’d trade my pickup to get them back. Just as fetching was the Winchester Model 70 Alaskan with a 25-inch barrel in .338 Winchester Magnum. A fellow rimfire competitor used one for elk. I managed to snare a fine example at a gun show and hunted with it. After one singularly unproductive day in the hills, I bounced a herd of elk in a ‘pole patch. Racing after the thunder, desperate for a wink of antler and a shot alley, I heard a branch snap behind me. I spun to see a bull slipping off to the side. My .338 staggered him; a second shot put him down; I fired a third to finish him. He’d taken more than 7,000 foot-pounds from the first hits, both in the chest. A departing elk can be hard to anchor! The .338 with 225- or 250-grain pointed bullets (Nosler’s 210 Partition too) can bring a ton of energy out to 400 yards. In recoil, the .338 reminds you of its horsepower. The 7mm, .30 and .33 magnums beg the use of stoutly constructed bullets to ensure penetration through thick bone and muscle up close. Once, in Montana’s Bob Marshall Wilderness, I chose a 200-grain Winchester Power-Point over stronger missiles because it drilled tighter groups. One dreary afternoon while descending a mountain on horseback, we spied a bull elk across a cut. He was moving by the time I’d swung off Paint and jerked my rifle free. I triggered the Model 70 as he galloped toward cover. The bullet caught him mid-rib, ranged through the heart and balled up, perfectly mushroomed in the far shoulder. With a 180-grain bullet at 3,100 fps, the popular .300 Win. Mag. shoots very flat and drives bullets deep. The .338 is a fine pick for quartering shots. Also, its 225-grain bullet flies flatter than a 180 from a .30-06, so it stretches far. Better still by ballistic measure: Weatherby’s .340, its 1962 debut buried in the tickertape strewn for the 7mm Remington and .300 Winchester. The .340 is a blown-out, necked-up .300 H&H, left full length. It blasts a 250-grain bullet downrange faster than an ‘06 can throw a 150! At 500 steps the .340 hits like a .338 at 400. Shintangle Montana timber in knee-deep snow yielded an elk to my long-limbed Weatherby Mark V in .340. That 250-grain Nosler packed far more foot-pounds than needed. In truth, many elk hunters are over equipped. To kill an elk you need not land enough energy to rock an armored personnel carrier. But that misconception is common. After years of reading about and dreaming of record-book bulls, we labor up the mountain with visions of cudgel-thick antlers that, upside down on a tall mule, furrow the earth. Said elk will appear at great distance, quartering steeply into a fir jungle, a heartbeat from gone. While you may get this shot, a powerful cartridge hardly guarantees a kill. Once, when topping a hill, I refused to fire at a magnificent bull, statue-still, facing me at about 300 yards. My rifle: a Lazzeroni bored for the short, stout 8.59 Galaxy, a ballistic match to the .340 Weatherby. Alas, though the air was still and the bull patient, a landform hid the bull when I eased to a sit. In vain, I tried to calm the crosswire offhand. Rather than risk a crippling shot, I let the elk walk. On another morning my Galaxy took a lesser bull. He absorbed the heavy .33 bullet with a slight shudder then moved on into the forest – where he died in seconds. I’d seen the same reaction in a bull shot with my .375 H&H. The 300-grain softpoint destroyed both lungs at close range. The elk galloped off, nosing into the duff a short distance off. These and other encounters have convinced me that no hunting bullet knocks elk down. Elk fall when they die – when vital organs no longer function – or when bullets strike nerve centers or break supporting bone. One of two bulls I’ve taken with a .30-30 collapsed when the softnose smashed vertebrae behind his skull. Instant kill. (By the way, that’s a shot I take only when very close. A hit in surrounding tissue can doom the animal to a slow death.) Lung-shot elk succumb most quickly when struck by bullets that do the most damage. Left to right: Winchester’s .270 is gentle in recoil but lethal. The .270 Weatherby and .270 WSM add punch. Occasionally elk have died more quickly than I expected. One, lung-shot by a client with a .270, reared as might a horse then fell backward, planting its long beams in the ground. No further movement. Another bull, struck mid-rib by a 140-grain .280 bullet, simply crumpled. I can’t explain those kills. More often elk hit well will leave as if untouched. Given an accurate shot with an appropriate bullet, the trail should be short. But you’ll do well to keep firing as long as the elk is upright. One bull trotted off after I drove a .270 bullet into its forward ribs. A second shot to the spine between the shoulders dropped the beast. My first missile had blown a big entrance hole but damaged only the near lung – evidence that bullet was too fragile for elk. Had I not fired again, the animal would doubtless have escaped to die later. Bullet design can matter more than bullet energy. Shot placement trumps both. Dashing at last light after a bull crippled in the front legs by another hunter, I fired when the elk paused, killing it with a 100-grain softnose from my .250 Savage. While such a bullet is hardly ideal, it’s adequate if you take care with each shot. A rancher I know has killed dozens of bulls with his .250. Another friend has used a .25-06 to take 20 elk, without losing one. Once, a fellow bringing his young son on his first elk hunt asked if he should loan the boy his .30-06. “He has his own 6mm Remington, but isn’t that a bit light?” I allowed that it was, but added that the recoil of an ’06 might cause flinching. “Accurate shots kill elk.” Next morning we climbed into the Utah hills where the boy laced a 6mm Nosler Partition through an elk’s heart. The animal died right away. Sometimes power is comforting. On a stormy morning in the northern Rockies, I climbed a ridge across from a herd of elk I’d spied at dawn. Unable to approach the bull on the herd’s far flank, I paralleled the animals until the bull moved apart in a logging slash 300 yards out, just shy of timber. When the Swift A-Frame from my .358 Norma Magnum struck, the elk crashed as if the earth had been jerked from under it. Essentially a .338 Magnum with a bigger mouth, the .358 Norma can push 250-grain bullets faster. It put an exclamation point on that lung shot. The main problem with such potent cartridges is that they kick hard in rifles light enough to carry all day in steep places. So, I’ve hunted elk with less ambitious rounds. On a particular Wyoming hunt, a pair of bulls piled off a timbered ridge ahead of me and split. I crashed headlong after the left-hand animal hoping for a shot as he lunged down the steep face through the lodgepoles. Suddenly, a sliver of rib came clear. Rifle braced against a tree, I sent a bullet from the 6.5×55 and heard it hit. The bull labored – as did I – through more deadfall. Another glimpse, another 140-grain softpoint, and the elk collapsed. A year later, a 7mm-08 got me an elk in that same canyon. I managed to find one more bull there when the .270 WSM came to market. I believe this was the first elk taken with it. Another stubby powerhouse, the .300 Remington Short Action Ultra Mag, also came my way before I’d heard of it dropping an elk. Again, I was fortunate to bring back a bull. More recently, with a Montana rifle bored for the largely unsung .280 Remington (circa 1957), I climbed under a bleak, black sky toward timberline. Still-hunting through stunted pines at dawn, I caught the bobbing of an antler tine through the cover. Unaware but alert, the five-point eased up-slope. I angled toward him getting an offhand shot at 60 yards. Two more 140-grain TSX bullets sailed after him as he crashed then rolled into a very steep canyon. Even when you know a hit is fatal, follow-ups make sense – if for nothing more than to limit the climb packing out! Dating to 1873, the .45-70 can be loaded stiff in modern rifles. It’s a deadly elk round in close cover. Many elk have fallen to traditional lever-action Winchester and Marlin carbines bored for the likes of the .30-30 and .32 Special. Commonly considered marginal, they’re deadly at iron-sight ranges. You must simply decline long shots and quartering pokes – as bullets for such rifles were designed for deer hunting – not to drive the length of a bull elk. Hornady LEVERevolution ammunition, with pointed bullet tips of resilient polymer, offer higher starting velocities and flatter trajectory than flat and roundnose loads. Still, one of my biggest bulls fell to a blunt .30-30 bullet. I scrambled uphill under the pines as the bull brayed again. Short minutes later he crashed into view, charging down toward us. At 55 yards, the 170-grain softpoint drove into his chest. He spun and stopped behind a screen of brush as I cycled the Marlin. Silence. I waited, then lizard-slow, crawled to the side. A slot opened to his rib. I fired. He lunged. I fired again. He fell. On another elk expedition I’d have been lost had the bull appeared at 200 yards. But a well-placed .32 Special bullet – a pointed Hornady – took a Wyoming elk handily for me at 130 steps. I’d muffed a chance earlier in the day, hiked far, then sat to rest near a trail juncture. Glassing the slopes around, in a burn I spied a branch that curved up. Odd. Other limbs on those fir skeletons drooped. Then I saw the ear and backline of the bull. He was staring at me. I centered the bead in the aperture and aimed tight to the tree. At my shot, the elk rocketed off. Apprehensive, I climbed to the trail. A scarlet spray on the snow confirmed a lung hit. The six-point lay dead just 50 yards away. Hunting with such rifles and loads adds challenge – and thrill – to any hunt. I recall sneaking into a bedded bunch of elk through yellow Colorado aspens. Tension mounted at each step as I skirted cows almost near enough to touch. When my scent detonated the herd, I missed with the Marlin 1895 before the departing bull’s hide winked one last time in a sun-dappled alley. That .45-70 bullet connected. Having killed a handful of elk at very close range (one with an arrow at seven yards), I remember well the day I carried a Mark V rifle in 7mm Weatherby Magnum. It had been a frustrating hunt, mostly in rain, in tough country. On the last afternoon my companion spied an elk slipping into hilltop cover far away. We closed on foot to a patch of cedars 340 yards across a brushy valley from the spot. Glassing, I saw brief movement. The elk had bedded, risen, bedded again. With no time left to wait, I marked as best I could its location, then stalked in. When cover I had marked vanished from valley-bottom view, I groped uphill through cedars thicker than they’d appeared. Careful steps put me at the hem of the target thicket. Then – a spot of color! The tip of a tine. Seconds passed. Soon my scent would reach the elk, sending it out the back door. I eased sideways, my movement glacial. A patch of hair in a grapefruit-size gap told me the elk’s body position. At a mere 14 yards my TSX zipped through the shoulder. While a 7mm spitzer at 3,250 fps was hardly necessary there, it was no handicap. In most elk country you can’t count on close shots. A .270 Weatherby proved just right for a bull years earlier in the Bob Marshall Wilderness on a snowy slope with lots of elk and no stalking cover inside 250 yards. The time I hunted with Middle Fork Outfitters in Idaho’s Frank Church Wilderness, I chose a Model 71 Winchester chambered for the wildcat .450 Alaskan. This old lever action had a receiver sight and was ideal for the close cover in which I almost got a shot. Alas, a cow winded me and took the herd to another drainage. Some days later at timberline, we spied a scattering of elk on a ridge far below. The bull looked big. “Take the Ruger,” insisted my pal Ken Nagel, handing me a No. 1 barreled to 7mm WSM. As time was short, I relented, then raced down toward the elk. But the herd beat me to a pass and lined out toward thick forest below. I scurried to a bush on all fours, snugged the sling and searched frantically for antlers as the elk bunched to negotiate deadfalls. I found a slot. The bull paused, but a cow stood behind. I waited. The cow moved. I pressed the trigger, dropped the lever and shoved another round home as the thud of a hit floated back 330 yards. The bull allowed another hit, then fell. There would have been no shot at all with the iron-sighted 71. This elk fell to another 6.5, the 6.5 Creedmoor, at very long range. That’s a Magnum Research rifle and a GreyBull Scope. While I’ve guided hunters to record-book bulls, most of my hunting has happened where any six-point elk is a prize. My two best bulls, both still-hunted, dropped to a Remington CS Model Seven in .308 and a lightweight re-stocked Springfield in .30-06 Improved. Each animal traveled a short distance after a lethal first round. Each required a finisher. It’s no better than the .35 Whelen Improved that floored a Washington bull in cover, or the 7mm Dakota that tumbled an Arizona six-point atop a desert plateau, or the mild-mannered 6.5 Creedmoor that killed a New Mexico elk farther than I’ve shot any other. But if versatility is the gauge, Norma’s .308 Magnum with 180-grain spitzers at 3,000 fps is hard to beat. In mid-weight rifles its recoil is brisk but not obnoxious. Bullets fly flat as a .270’s, but hit much harder. Controlled-upset missiles like Federal’s Trophy Bonded, Swift’s A-Frame, Norma’s Oryx, the Barnes TSX and Nosler’s Partition and Accubond drive to the off-shoulder of quartering elk bounced in thickets. Why not the .300 Winchester? A ballistic twin, it’s much more popular. But I prefer the slightly shorter case and longer neck of Norma’s round. Truthfully, such distinctions are meaningless. Naming runners-up is just as hard. How about the 7mm and .270 Weatherby Magnums, the .300 Holland & Holland, the .300 Ruger Compact Magnum or .300 SAUM? The .30-06? If Remington’s 7mm Magnum or some WSM hikes your pulse, or you’re enamored of the .280 Improved or a wildcat like the .30 Gibbs, you’ll get no quarrel from me. The best elk load for your rifle is what’s chambered when a bull appears in your sight! 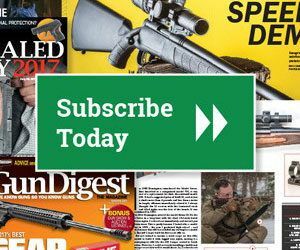 Wayne van Zwoll is a regular contributor to the Gun Digest annual, and author of the Gun Digest Book of Sporting optics. He is a nationally-recognized expert on rifles, optics and western hunting. Shot placement is more critical than bore size or bullet weight, and that can only be achieved by getting close to your quarry…biggest bull i ever shot i killed was at 75 +/- yards with a 100 grain .243(6mm)…An old rancher i got to know in Colorado shot his elk with a well worn iron sighted .30-.30, he stated that he liked to get close enough to see his reflection in the bulls eyes before he’d shoot…These articles and t.v.programs of guys shooting deer and elk at 600-1000 yards are ridiculous…whatever happened to HUNTING?…Now its just shooting.